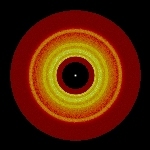 Exoplanets and debris disks show that planetary systems are fairly common. My work with Ben Bromley (Univ of Utah) involves computer calculations of planet formation applied to our solar system and other planetary systems. Our goal is to simulate the formation of planets like the Earth, Jupiter, and Pluto on a high-speed computer and then to compare the results of the simulation with observations. To make our simulations, we built a sophisticated hybrid computer code that combines a coagulation algorithm with an n-body code. We are applying the code to understand planet formation in a variety of circumstances. The links describe some of our ongoing projects. Newly formed Earth-like planets leave behind rings of dusty debris along their orbits.